AMG, the performance racing division of Mercedes-Benz, got its hands on the Mercedes-Benz CLA-class sedan and GLA-class crossover and massaged an amazing 355 horsepower out of a 2.0-liter inline four cylinder engine. Mercedes-Benz claims the AMG handcrafted turbocharged direct injection engine is the most powerful 4-cylinder engine in production and boasts the highest horsepower per liter ratio in the automotive industry. The intercooled twin-scroll turbo engine is rated at 332 lb-ft of torque at a mere 2,250 RPM and a 0-60 MPH time of only 4.8 seconds. Owners of 2014, 2015 and 2016 Mercedes-Benz CLA45 AMG, and 2015 Mercedes-Benz GLA45 AMG, models with a 2.0-liter turbo engine can now equip this amazingly powerful engine with a replacement air filter from the authority in washable air filters, K&N. This reusable air filter is designed to fit into the stock air filter box of 2014-2016 CLA45 AMG, and 2015 GLA45 AMG models without any need for modifications. K&N replacement air filters are made with specially woven cotton gauze. Because cotton, by nature, is more breathable than paper, a K&N replacement air filter can flow more air than a typical paper automotive air filter. More air and less restriction for such a highly tuned engine can result in a boost in performance and better acceleration. It would be false to assume that an increase in airflow with a K&N air filter comes at the expense of filtration efficiency and engine protection. 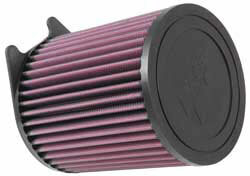 K&N engineers place filtration efficiency and dirt retention as a priority when developing a replacement air filter. K&N performs filtration efficiency testing following the internationally recognized ISO 5011 protocol with ISO coarse test dust to ensure that our air filters will provide high airflow without sacrificing engine protection. Perhaps more exciting than an increase in performance from installing a K&N replacement air filter is the fact that they are also a washable and reusable air filter. The ability to wash and reuse a K&N air filter means that it will pay for itself over time. The K&N washable air filter E-0661 for 2014-2016 Mercedes-Benz CLA45 AMG and 2015 Mercedes Benz GLA45 AMG models with a 2.0-liter turbo engine can be washed and made like new using one of the K&N Recharger air filter service kits. K&N air filters for the Mercedes Benz A45, Mercedes Benz GLA45 and Mercedes Benz CLA45 can be found on the Mercedes Benz A45 Air Filters, Mercedes Benz GLA45 Air Filters and Mercedes Benz CLA45 Air Filters page. K&N products for other vehicles can be found using the Vehicle Search Tool. To find a K&amp;N dealer near you, use Search for K&N Dealer.